We are well setup to provide the quickest glass replacement service for your broken stove glass. We know how important it is to get new glass in your stove so you can continue using it. Many of our customers are likely to be elderly or living in remote areas where the stove is essential for survival. We make it our mission to provide the quickest possible service so you can keep warm. We stock glass for over 500 models of woodburning and multifuel stoves, and can quickly cut custom glass to order if you have a rare stove or you are not sure of the model. We can cut glass to custom sizes - please use our Custom Cut Glass calculator to get an instant price. 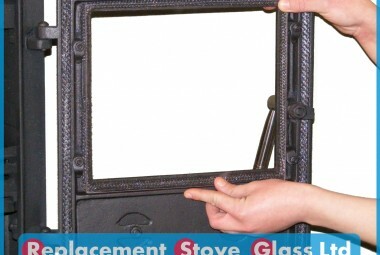 We can supply replacement glass for 100's of manufacturers and models of stove. If you don't know the model name, no problem, just let us know the size and we can cut your glass to order. New rope seals, glue, cleaner etc.